Katori is a fifteen year old girl who attends Sei High School. She's a little loud mouthed and has been called Lina Inverse a lot, because she resembles her. Katori has long red hair and blue-green eyes. She has a boyfriend, his name is Otonashii Hebi. However, she only gets loud-mouthed with people she knows. She's normally silent otherwise. Katori says this to transform into Sailorares. She raises her henshin stick (which is purple with a red star on it) and red flames engulf her and pieces of the fire flare up and make the parts of her fuku, then she finishes with a strike of a pose. This is Sailorares' only attack. Raising her hands, her body glows with a red aura and then a huge tidal wave of fire forms behind her and washes over the enemies, burning them. Katori OR Sailorares says this to transform into Super Sailorares. Same transformation as before but she has arm shields. This is Super Sailorares' only attack. Raising her hands, a aura of flame encircles her and she then takes a hold of one of them and it becoms as shjarp as a razor. She then tosses it at her enemy, slashing and scorching them. 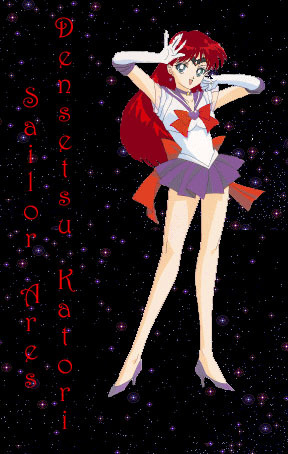 Katori OR Super Sailorares says this to transform into Eternal Sailorares. Same transformation as before but she has armored arm shields and a long back bow. This is Eternal Sailorares' offensive attack. She closes her eyes for a moment, then they snap open, aflame with anger. The fire then seems to leap from her eyes to the body of the enemy, melting them. This is Eternal Sailorares' defensive attack. Waving her right hand back and forth, a red smoke is created, it is delivered into the hearts of the Senshi and Knights when they are distracted by some means and brings them back, full force.